Knit By God's Hand: Told ya so! 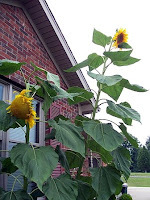 Look at my sunflower that I mentioned on an earlier post - ITS HUGE!!!! Its starting to fall over so even in this picture, its not at its full height! Look at the leaves over the twins heads - its bigger than them! I love sunflowers! They are so awesome. 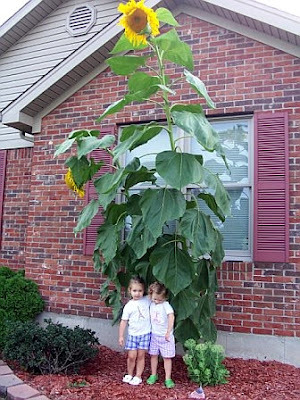 I had a bunch of them one year, and I harvested the seeds and fed them to the birds that next winter. That was very cool.